With more than 2.3 million inhabitants, Dubai is the largest metropolis in the United Arab Emirates. Most of the inhabitants of the Emirate of Dubai live in the city centre and it is here that most of the social, cultural and political life takes place. 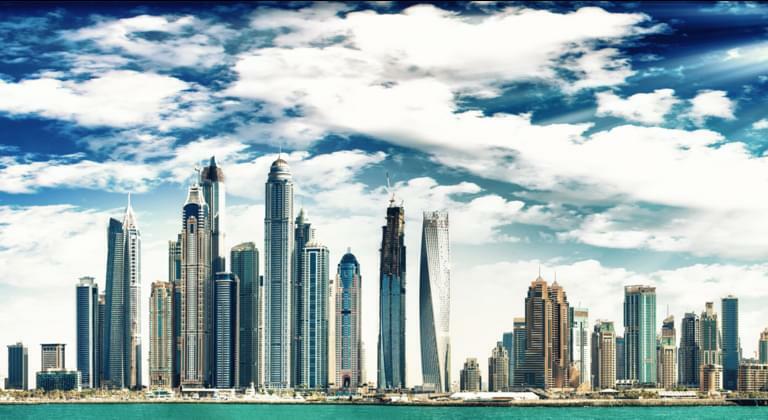 Dubai is attracting an increasing number of tourists from all over the world with its sightseeing attractions, and by 2013 the number of arriving travellers had reached 40 million. The desert metropolis offers a unique blend of highlights, where oriental traditions meet spectacular architecture in perfect sunshine. In Dubai, the tourist attractions are scattered all over the city, so ideally, as a holidaymaker, you should use a rental car to get to the hotel and highlights. The following article describes the international airport in all relevant details. You probably want to pick up the cheaply booked rental car from the airport. Find out in which terminal your car rental company has its office and at which pick-up point you can find the car that you could rent cheaply through us. Dubai International Airport is located about five kilometres southeast of the city centre. It is one of the world's largest airports - 80 million passengers per year. Dubai's airport, which began operating in 1960, reaches the limits of its capacity every few years, and there are always extensive expansions to follow. Its future is strongly linked to the rise of Dubai as a business metropolis, and the number of flights and air travelers is also increasing. Dubai International Airport currently has three large terminals, one of which is designed exclusively for handling A380 flights. International flights operated by other airlines and not by Emirates take off and land at Terminal 1. Terminal 2 is reserved for national and regional flights, while Terminal 3 handles all flights operated by Quantas and Emirates. Dubai's airport is very extensive, the terminals are difficult to reach on foot because of the distances. You can travel back and forth between the terminals with the airport shuttle, the transfers are free of charge and take place every 20 minutes. Terminals 1 and 3 are also connected by subway. Dubai International Airport's IATA code is DXB, operated by the Department of Civil Aviation of the United Arab Emirates. As an independent comparison portal for car rental providers, we at Driveboo.com work with every car rental company at Dubai International Airport. You can compare all the car rental companies with us and book a cheap car at the preferred company. On our website you can rent your vehicle not only at a low price, but also with all the necessary accessories (navi and child seats) as well as the preferred insurance package. A reservation made through us means for you to arrive relaxed at the international airport and to pick up your rental car after a few formalities at the car rental company or at their pick-up station. Afterwards you can relax in the hotel, which has already been booked. You will find the counters of every car rental company in all the terminals of Dubai International Airport, so it doesn't matter which terminal you arrive at. Your rental car company or your car rental company is present either in Terminal 1 (international flights of different airlines except Emirates) or in Terminal 3 (travel with Emirates or Quantas). You will see the advertising posters of the car rental company already from the baggage claim area and you will only have to take the shuttle bus to another arrivals hall in the worst case. Ideally, your car rental company has already informed you of the location when you make your reservation and is also represented in the terminal area of your arrival. Every car rental company is open from 8am to 6pm, some car rental companies even leave the counter open 24/7. Your car rental company is already waiting for you at Dubai DXB Airport with the completed rental contract. All you have to do is check if you could rent the car with extras and insurance as cheaply as you promised. According to our experience, most of the time everything is fine, now only your signature is missing before the inspection at the pick-up station. Every car rental company has a pick-up station at Dubai Airport in one of the car parks of the corresponding terminal. Car rental companies with counters in each terminal have multiple pick-up points. Ask your car rental company about the pick-up station and use the free shuttle bus if necessary. Irrespective of how cheaply you could rent your car from us, you must critically examine the rental car at the pick-up point. Please check the functionality of the lights and brakes, all other controls should also undergo a short test. Checking the bodywork is just as important. If you discover old dents or scratches, have them noted in a list of complaints. If you generously overlook such deficiencies, the car rental company can hold you responsible as the alleged perpetrator when you return the car. In case of technical defects resulting in reduced traffic safety, you should immediately request another car from your car rental company. Which fuel option should you choose for your Rental Car? In any case, we recommend that you choose the tank control "full-full". You will receive the rental car with a full tank and will drop it off the same. This means that you only pay for the fuel you actually use and do not have to bear any extra costs for tank services. The nearest petrol station is only 1 km away from the airport (DXB). From the pick-up station of your car rental company you drive to the exit and arrive on the six-lane city highway, which takes you to the hotel in a few minutes. You need an international driver's license to rent and you have to get used to the fast driving style of the locals during the first few kilometres. Although the streets of Dubai are very well developed, please keep to the speed limits, as the police control foreigners in particular. In the Emirates people drive to the right and overhaul on the left, there are many free parking spaces, but also zones where unauthorised parking can bring the tow truck onto the road. Avoid driving during the rush hours and be absolutely sure to avoid driving during the previous alcohol intake, as the alcohol limit in Dubai is zero. Considering the criteria listed here, the rental car is the ideal means of transport to the hotel and the many sights in the desert metropolis. For example, the car will take you from your hotel to the historic old town in the Bur Dubai district, to the landmark of the metropolis, the Burj Al Arab or to the Dubai Aquarium or to the Aquaventure water park for swimming. In addition to all the highlights in the city centre, just outside the Emirates metropolis there are magnificent public beaches with white sand. These Public Beach Parks are very well-kept and equipped with everything you need, your cheap rental car will bring you from the hotel comfortably to relax at the seaside. Cheap and foresighted rental offers you the opportunity to experience the Emirates outside of Dubai. Ideally, you have opted for an all-terrain rental car and can therefore venture a side trip into the Rub Al-Khali desert from the hotel.